Defense contractors are cashing in on today's scary world. Lockheed Martin (LMT), the global leader in making weapons, reported a jump in profits on Tuesday and ramped up its outlook for the rest of the year amid strong defense spending by major governments. The U.S. defense contractor's stock climbed 2% to another record high, up an impressive 20% this year alone. Rival defense stocks Northrop Grumman (NOC) and Raytheon (RTN) also rose to fresh all-time highs and continued to outpace the broader markets. Clearly, it's a great time to be in the war business. There is no shortage of conflicts around the world to support sophisticated weapons like Lockheed's Hellfire missiles and F-35 fighter jets. The future is also looking bright for defense spending under either Hillary Clinton or Donald Trump. That's why Richard Safran, an analyst who covers Lockheed, said he's "really bullish" on defense stocks and believes the industry is in the early days of a new 20-year spending cycle. "You're looking at substantial and consistent increases in defense spending," said Safran, director of equity research at the Buckingham Research Group. Just look at Lockheed's latest numbers. The company's profits jumped by 13% and easily surpassed what Wall Street was expecting. Lockheed's sales got a boost from its recent $9 billion acquisition of Sikorsky, which makes the Black Hawk and Marine One helicopters. 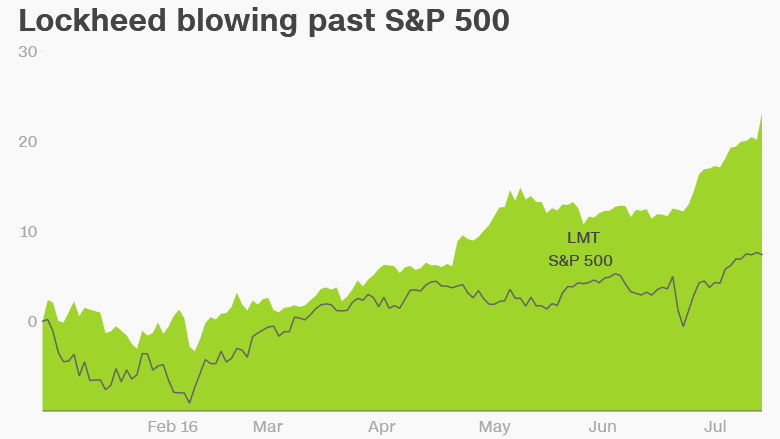 Lockheed also boosted its guidance for the rest of the year by a healthy margin. The optimism makes sense given the wave of conflicts on the radar these days. 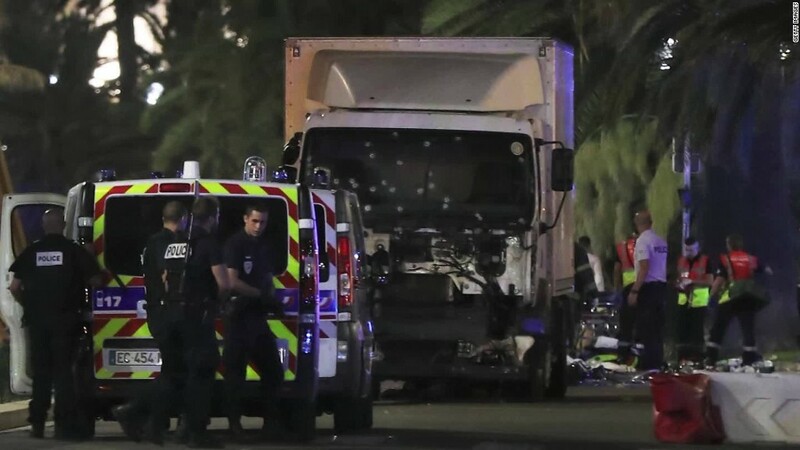 A wave of terror attacks like the recent rampage in Nice, France and the Istanbul airport attack show that terrorism in general and ISIS in particular remain a serious threat. That means continued, if not accelerated, defense spending by the U.S. as well as its allies in Europe, the Middle East and elsewhere. Lockheed, with one-fifth of its sales overseas, has scored some recent overseas defense contracts. For instance, in May the U.S. approved the sale of $475 million Hellfire missiles plus training and support to the United Arab Emirates, according to Defense Security Cooperation Agency. Lockheed was also one of the companies awarded a $260 million contract from Oman for F-16 logistics support services and equipment. North Korea also continues to rattle nerves of U.S. ally South Korea. On Monday, the country fired three ballistic missiles off its eastern coast. The missile test occurred just days after South Korea announced plans to deploy the Lockheed-made THAAD missile defense system southeast of Seoul. Safran also notes that both China and Russia are developing fifth-generation tactical fighter jets aimed at challenging America's air dominance. He said the new planes are aimed at competing with Lockheed's F-22 Raptor. "The world is catching up," said Safran. Unlike for many other industries, the U.S. presidential election doesn't seem to pose many downsides for defense companies. Clinton is viewed as somewhat of a hawk on foreign policy and has supported the idea of maintaining a strong military. Trump is in favor of expanding the military's role and recently pledged on "60 Minutes" to "declare war" on and "wipe out" ISIS. "I would view a Trump administration as being very bullish for defense. And Clinton won't go remotely negative on defense. She would be a status quo candidate," said Safran.